Perhaps it’s fitting that the only remaining member of the 2004 Red Sox yet to appear for the Red Sox in the 2008 playoffs now seems to be the 2008 Red Sox’ last hope. If the Red Sox lose tonight, they will be down 3 games to 1, and though they found themselves at a similar disadvantage in last year’s ALCS and an even worse hole in the 2004 ALCS, it seems unlikely that they would be able to dig themselves out of such a hole once again. They pretty much have to win tonight. And to do so, they pretty much have to get a good game from Tim Wakefield. Wakefield has been my favorite Red Sox player for a long time. First of all, he throws a pitch so erratic and unpredictable it resembles life itself. 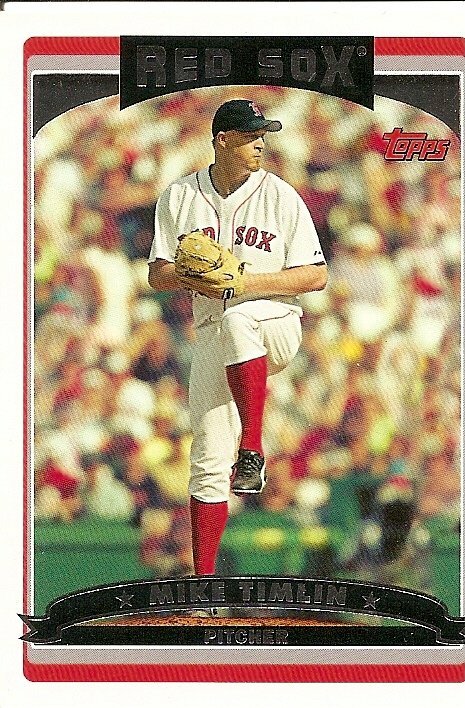 Also, it is starting to seem that he has always been on the Red Sox (besides being one of the last of the 2004 Red Sox, he’s also the last of the 1995 Red Sox). And I just like the way he quietly goes about his business. According to his peers, he has always been a great teammate, an attribute most famously on display in the 2004 ALCS playoffs, when he volunteered to sacrifice his game 4 starting assignment in order to save the bullpen in the 19-8 massacre in game 3, a sacrifice that is pointed to by his manager as a turning point in the series that was the turning point in Red Sox history. You are currently browsing the archives for the Mike Timlin category.